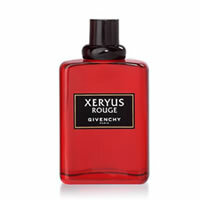 Givenchy Xeryus Rouge was the first oriental fragrance from Givenchy. Givenchy Xeryus Rouge is supposed to be the aftershave equivalent of giving your lover a bunch of red roses, at once passionate and emoitional it is a sensuous fragrance for men. Givenchy Xeryus Rouge aftershave begins with a very lively top note of fresh and green scents of kumquat, cactus and tarragon, which enhances the warm scents of cedar leaf, red pimento and African geranium and the rich sensuous end note of cedarwood and sandalwood that bring nobleness and authenticity, and accords of tender and voluptuous white musk, and ambergris.